So time for a full confession. This is the second week in a row that I have put my post together and spent all day trying to figure out why Lauren over at http://www.lifelovelauren.com hadn’t put up the link post. It’s usually around 5pm when I figured it out. It was Sunday. This is a post done every Tuesday. The sharpest knife in the drawer, I am not lately. Anywho, this is the last week of this week’s round of topics! no student loans, and no medical bill due! I know it’s far fetched in some ways. But in others obtainable. And after three years of unemployment, it’s currently all I am working towards!!! ← Stop spending my money! It is not far-fetched in any way , shape or form. I understand the unemployment issue, I’m currently in it as well from my career and I know that dreams in that world can still happen. Good luck! 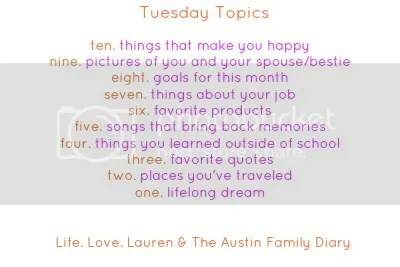 Stopping by from Tuesday Topics! Haha no worries. Today I went to go see everyone’s post and realized I forgot to post mine today! I tried to schedule it through my blogger since I knew I was going to have a long day at work today and I must have messed something up since it didn’t post! oops! I totally hear you on your goals. I did not enjoy being unemployed one bit!